Psoriatic arthritis is a special type of arthritis that occurs in some patients with psoriasis, a chronic skin condition. It resembles rheumatoid arthritis in its effects, although most people experience a mild form. Symptoms of psoriatic arthritis include both skin disorders and conditions of the joints and can cause symptoms of psoriatic arthritis as well. There is no cure for psoriasis or psoriatic arthritis, but there are many treatments available to relieve symptoms. It is a chronic, however, and if left untreated can cause serious health problems. Symptoms of the most common form of psoriatic arthritis affects the tips of the fingers or toes. However, one in five cases of the disease can affect the spine. The less common form of psoriatic arthritis is called psoriatic arthritis mutilating "the objectives of the joints, causing severe destruction. Psoriasis is a rough, scaly type of rash that appears most often in the knees, elbows and scalp. The rash consists of red scaly patches or silvery gray on the skin. Psoriatic arthritis occurs in about five to ten percent of the 30 million Americans with psoriasis. The condition affects men and women equally and usually appears between the ages of 30 and 50. In approximately 15 percent of patients the onset of psoriatic arthritis may precede the onset of psoriasis. The progress of psoriatic arthritis is usually mild in most people and may affect only a few joints. What causes psoriasis and psoriatic arthritis symptoms? The skin is composed of several layers, a thin outer layer of dead cells, the inner layer of the skin. The regenerated skin is usually completely in the course of about a month from the outer layers of the lower layers. The "new skin" replaces the layer below top of him, while the outer layer of dead skin cells fell apart. In patients with psoriasis, however, part of this process happens too quickly. The skin is rather a matter of days, and layers of skin cells cannot be shed quickly enough. The accumulation of these dead skin cells then causes thick patches, itching in the body. The most important symptoms are those which are dry, scaly skin. The areas may be cracked or raised, and covered with silver look at points. The area around the patches may be red, with small pustules or blisters. These patches are often itchy and sore. The most common areas that are affected by psoriasis are the elbows, knees, skin folds, and the trunk, but can affect skin anywhere on the body. Patients may also experience problems with their toes or nails, and / or burning eyes and itching. No known triggers of psoriasis outbreaks, although the cause is not fully known. Injury to the skin such as abrasions or cuts, insect bites or other rashes, can aggravate the symptoms of psoriasis. Persons who are immunosuppressed due to chemotherapy, AIDS or other diseases such as rheumatoid arthritis are also at risk of more severe symptoms. Many other factors such as alcohol, lack of or excessive sun exposure, and stress can contribute to outbreaks ofdisease. The disease is not contagious. Your doctor may take a skin biopsy of one of the scaly patches, and / or blood tests for diagnosis of psoriasis. More commonly, however, the diagnosis is made on the basis of clinical history and examination of the skin and / or nails. There are actually five types of psoriatic arthritis, each with different symptoms, disease progression and treatment. Most people with psoriatic arthritis experience only mild symptoms of arthritis, and in only a few joints. The most common causes symptoms in only one or two joints. For those who experience more severe symptoms, however, as in the spine, the symptoms can usually be treated with medications and other treatments. This type of psoriatic arthritis primarily affects the last joint of fingers and toes (the "distal interphalangeal joint. It is similar to osteoarthritis, and in fact often confused with that guy, although symptoms are generally limited to these joints only. Asymmetric arthritis usually affects only two or three together, and separately and not in pairs. It can affect any joint in the body, although common in the fingers and toes. Often, what causes your doctor may refer as "sausage digits", where the fingers are swollen. Joints are often red and hot to the touch. 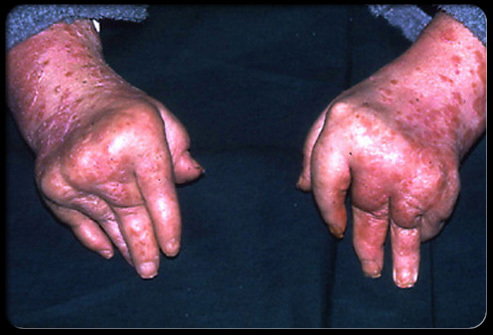 This type is quite common, affecting 55-70% ofpatients with psoriatic arthritis. It is usually mild, however, and does not advance as much as some other forms. It is quite sensitive to treatment with NSAIDs and other drugs. Symmetrical polyarthritis, also known simply as symmetrical arthritis, is identified by the fact that the swelling of the joints tends to occur in pairs, on both sides. For example, if the elbow is affected, both elbows are affected. It resemblesrheumatoid arthritis, although less severe. It's probably the second most common in patients with psoriatic arthritis, which affects 15-70% of patients. Can be severe and cause joint deformity and skin symptoms are often much more severe than in those with other types. Spondylitis refers to inflammation of the joints of the spine. This is a serious condition that can cause deformities and changes in posture as a result. It is less common than the above rates, affecting 5-33% of people with thedisease. In addition, patients with this form of psoriatic arthritis often experience symptoms in the joints of the arms and legs. The most prominent symptoms of this type include inflammation, pain and joint stiffness in the joints of the back and neck. Indeed, it can affect the ligaments in these areas. Mutilating arthritis is a very serious type of psoriatic arthritis. It is quite rare, affecting less than 5% of patients who are diagnosed with psoriatic arthritis. Its severity is due to the fact that actually destroys bone and cartilage in the joints, deformed joints of the hands and feet mainly. It tends to come and go in a number of exacerbations or relapses and remissions. These usually coincide with flares in the skin symptoms. Patients may have one or more of these types in the course of their disease and can actually show signs of several types at once, so that the identification of a single rate is not always possible. There are also three other forms of arthritis that can occur inpatients with psoriasis Reiter's syndrome, gout and rheumatoid arthritis. Reiter's syndrome is a disease that causes inflammation of the urethra, inflammation in the eye, and arthritis. 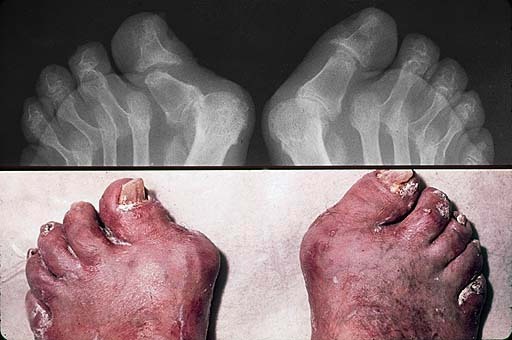 There is a venereal disease , but they do produce lesions on the genitalia and the palms, soles of the feet and mouth. Gout is a form of arthritis that causes inflammation and sudden attacks of severe pain, often in the big toe. It is the result of excess uric acid in the blood, which causes the crystals to form in the affected joints. Inpatients with psoriasis, the disease is usually only present for a short time. When the deformity occurs in one of the above forms of psoriatic arthritis, the disease can be easily confused with rheumatoid arthritis, which is a type of arthritis associated with the immune system resulting in severe joint deformation. These types differ mainly rheumatoid arthritis by the absence of a particular antibody in the blood of most patients with rheumatoid arthritis known as rheumatoid factor, in addition to skin symptoms. Rheumatoid arthritis can occur in patients with psoriatic arthritis as well, however. Your doctor will use tests like blood tests and x-rays of affected joints to help determine what type or types of arthritis you have. The cause of psoriatic arthritis is unknown. Doctors suspect that genetic factors, environmental and immunological play a role in the condition. It is classified in the group of diseases called seronegative spondyloarthropathies. Approximately 40 percent of people who develop psoriatic arthritis have a family withpsoriasis or arthritis. The nature of the symptoms of psoriatic arthritis range depending on the type, but are generally similar to those of other types of arthritis. Patients often experience pain and stiffness or pain in the joints, usually in more than one joint. This pain is often accompanied by a reduced range of motion, or pain that worsens with movement. Psoriatic arthritis usually affects the joints of the fingers and toes more often, particularly joints near the ends of the fingers and toes. It also affects the knees and ankles. The pain and stiffness is usually worse in the morning, subsiding during the day. There is no cure for psoriatic arthritis. Treatment programs tailored to the patient's symptoms in order to manage more effectively. Because the course of the disease can be very different from patient to patient, factors such as remission and exacerbation of symptoms are also important to consider. Each patient is different, and our treatment program is tailored to their particular needs. Treatment plans include reducing inflammation in joints, reduce pain and prevent further damage. Psoriatic arthritis is actually treated the same way that the conditions of psoriasis and arthritis are treated individually. The skin is treated with topical and oral medications, including antibiotics. One objective in psoriasis patients is prevention of secondary infections resulting from skin irritation. Mild forms of arthritis are treated as accompanying other forms of arthritis, aspirin, anti-arthritis drugs and other medications. Nonsteroidal anti-inflammatory drugs or NSAIDs, are used to control pain and inflammation from the arthritis. Your doctor may inject steroids directly into the affected joints rather than prescribing medications for you to take at home. In patients who have this is not therapy, other medications may be prescribed. These include methotrexate and an antimalarial drug called hydroxychloroquine. Unfortunately, some medications used to treat a set of symptoms, especially those classified as malaria, may trigger an exacerbation, or worsening, in another set, so it is especially important that you talk to your doctor about any side effect you have the drug. It is also important to understand that there seems no relationship between the location of skin symptoms and the location of joint symptoms. You may have flaky patches on a part of his body and joint pain and swelling in a completely different part. It is unclear what the relationship between these two conditions. There are also some therapeutic treatments that can relieve some pain and swelling in joints, such as heat, cold, or soaking in hot water. It is important to get enough rest. Your doctor may also suggest an exercise program tailored to their condition, to improve their general health and joint health status. Other more aggressive treatments include corticosteroid injections into joints or injections of gold salts to patients with more destructive joint damage. In the case of joint damage very severe, surgery may be necessary, but not common. One concern is that the surgeon has the concern of the joint infection to go through injuries in the skin overlying the affected joint. Your doctor may refer you to a rheumatologist for specialized treatment for their condition. A rheumatologist is a physician who specializes in rheumatic diseases, or diseases of the joints. While psoriatic arthritis is not entirely rheumatic in nature, a rheumatologist, but can be very helpful in prescribing the best course of treatment for patients. Your physician may refer you to a dermatologist, a doctor who specializes in diseases of the skin to treat psoriasis. With proper understanding of their condition, and good health care, you should be much better able to help in their own treatment. By understanding the various factors that can cause asthma attacks in their symptoms, you can avoid these and minimize the effects on your body. Call our office for an appointment with Dr. Pisarek at (416) 633-3000 for an assessment to help determine what treatment options can be used to help your condition. then you will be referred to a health provider that may help you.